the first nice bag i ever owned was a louis vuitton noe. first designed to hold champagne bottles, something in the style and shape of the bag caught my grandmother’s eye sometime ago in france and it became her go-to purse. upon her death–when family was sorting through her things making piles of what to pass on, what to hold on to, what to donate, and what to discard–my mother found it in the donate pile. she saved it and it became mine. i love this bag. i love thinking of my grandmother and how she must have felt first purchasing this bag. my grandmother was a classy, chic woman but she was also financially savvy and chose to live simply and smartly. she was not dripping in diamonds and she drove a toyota previa. she was a bargain hunter and bought in bulk. but she also knew the value of a well-made piece; a bag that would last for many many seasons and whose design was timeless. the purchase of this bag was no after-thought for my grandmother, a second grade teacher who took investments very seriously. this was a very big deal. a treat for her. my grandfather understood and supported this mentality. he (a professor of psychology) did the same with the jewelry he would meticulously pick out and buy for her, himself, and his family. when my grandfather died in january, nearly eight years after his beloved, the family gathered in florida for his funeral. after the service was done and we were lunching on the porch, my mother and aunt and uncle gathered the grandchildren around. my grandparents had left behind a small inheritance as a gift for each of us eight. we were, my aunt instructed us, to do with it what we wanted and that their hope was we would find something meaningful or useful for ourselves that we could remember our grandparents by. i think for some of my cousins that included furniture for their homes. i imagine a beautiful dining room table or a new bed. for me, for jp and i, we took some of this gift money and bought goats. this was to remember my grandfather, the goat man. it took me a while to decide what to buy to remember and honor my grandmother. our home didn’t need anything. we didn’t need anything. 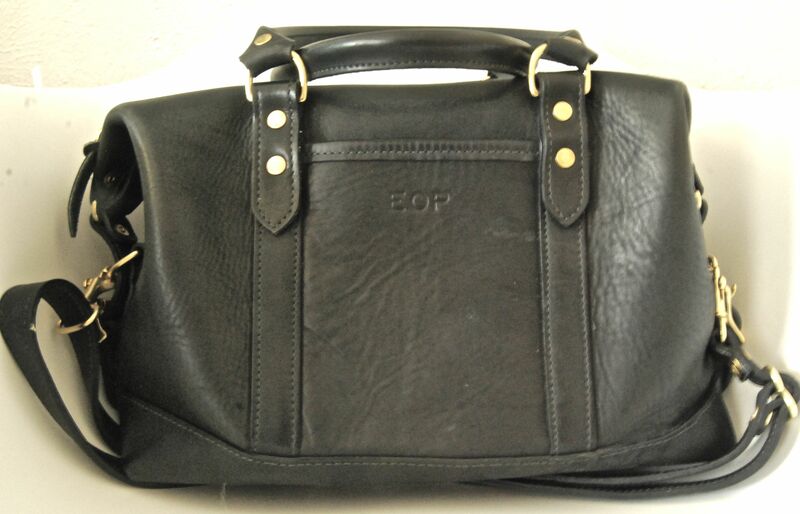 but then i remembered that on my “wish list” for many years has been a nice, black leather purse. it’s been sort of a joke between jp and i. i always ask for one for my birthday or for christmas and it’s always something we’re never in the position to purchase. pardon my lackluster photography skills. 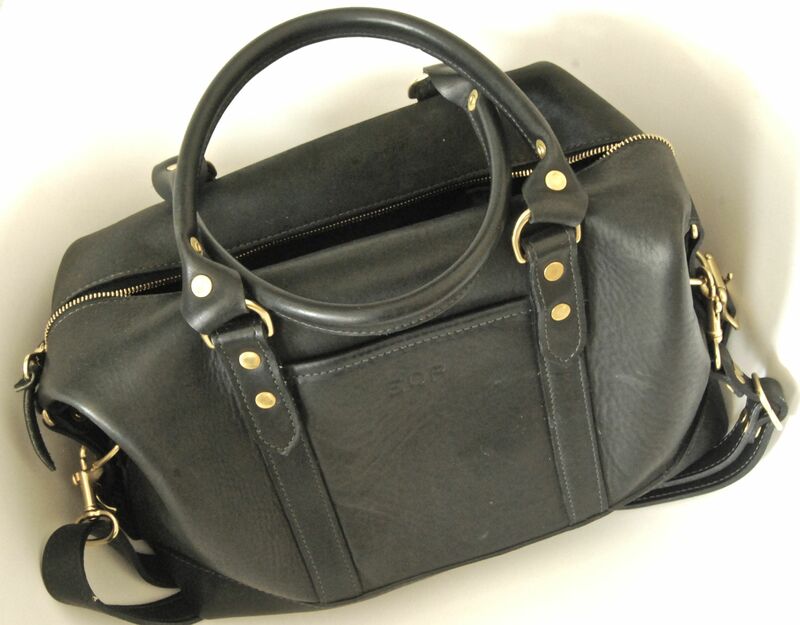 the fairmount satchel handbag (in a discontinued color) by j.w. hulme. it’s black, it’s slouchy, it’s beautiful. it reminds me of my grandma and i have a feeling this satchel and i are going to be friends for a very long time. hopefully, if i treat her well, i can pass her along to ramona one day. if you’re in the market for a new bag or luggage or anything leather for carrying goods, take a look at j.w. hulme. made by hand in america w insane attention to detail and respect for craft and quality. also, their employees are incredibly nice, knowledgable, and excited about what they do. we took a tour of the factory floor and watching the process and meeting the people who had created my bag made this experience so much more special and important to the story. I can just imagine Grandma’s reaction if she saw her purse in the Goodwill pile. She bought her purse in France during one of her many adventures – and she would be tickled that you treasure it.